Here at ApplianceDollyInfo we have produced this guide to help you find the best appliance dolly. 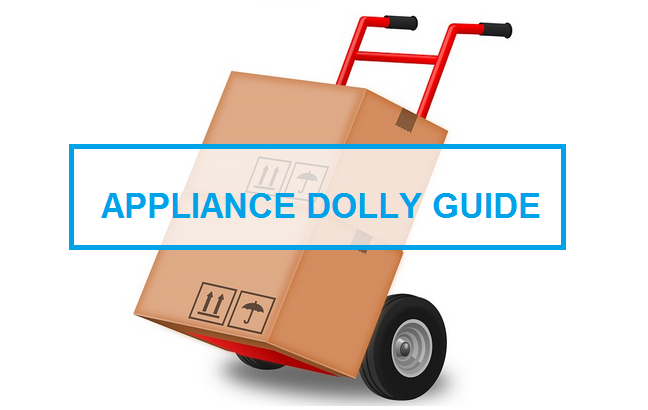 If you’re wondering how you could use appliance dollies to move your household items around safely then don’t get worried we have put together an in depth guide that provides all the information you need to know, be sure to check it out and leave us any feedback. Here are recommended appliance dollies based on their features, user reviews and user ratings. Click a link to quickly skip to the appliance truck that your most interest in. The Magna Cart is the most reviewed Hand Truck that we have found and scores an impressive 4.4/5.0 from over 1100 verified user reviews. The Magna Cart Ideal Hand Truck is engineered to move smaller, lighter items weighing under 150lbs so will not be ideal to move large bulky items. This dolly is designed to be an all-rounder, allowing you to move items quickly between rooms and can quickly be folded into an compact unit. If the loads that you expect to move are over 500lbs in weight then you want to have a sturdy, robust and easy to use appliance truck. The Harper Trucks 6781 is the best rated 500lb+ appliance dolly with a maximum load capacity of 800lbs. The 6781 is very similar to what you rent from U-Haul rental places. It is equipped with an offset belt tightener. The truck is constructed from 16 gauge tubular steel frame and WTS joints are robotically welded to give it strength and sturdiness. The best rated appliance dolly with 5.0/5.0 is the Yeats 59” Dual Appliance Hand Truck, however this is based on only 2 user reviews. It has heavy felt or plastic padding and is designed for moving both short and tall appliances. 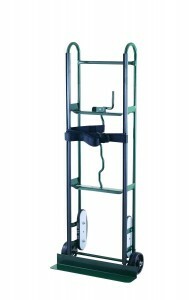 The Yeats 59” Dual Appliance Hand Truck keeps both short and tall appliances firmly in place. Order yours today. Use our comparison table to quickly find an appliance dolly that can handle the weight of the item that you want to move. We have also included the number of reviews and rating for each of the models. What is an Appliance Dolly? 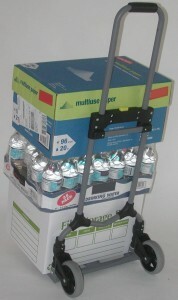 An Appliance Dolly is a simple piece of kit but offers loads of functionality. 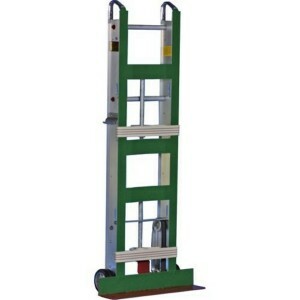 It is a metal framed piece of moving equipment that is shaped like the letter “L” similar to a hand truck. Its main purpose is to enable the movement and of large heavy household appliances for transportation. The dolly is generally constructed from steel tubing, with handles at the top and a flat plate along the bottom part. This gives it the L-shaped look. To move around with ease it will ride on large rubber tires. Appliance dollies will have steel tubes welded between the handle uprights to give the dolly increased strength and sturdiness. Many national and state retailers use the dolly to deliver various household appliances to customer’s addresses, this can include items such as washing machines and refrigerators. Even though the dolly is best suited to moving appliances, it can be used to transport other household items including couches and dressers. Appliance dollies are designed to move appliances so can easily withstand a minimum of several hundred pounds at. Before picking a dolly you may want to check what weight limit it has been rated by its respective manufacturer. There are appliance dollies for whatever use from those that can withstand small appliances weighing 500 pounds or so. More sturdier models can easily transport objects weighing 1200 pounds. Why do you need an Appliance Dolly? Moving items around your home, office or between buildings can be a difficult process. Most people often struggle to safely move heavier, bulky items such as refrigerators, office furniture and similar items especially on their own. The risk increases when moving there items over obstacles like stairways. Some people will choose to use a removal company but they can be expensive. Personally I have moved a couple of times when going to college and getting married and it was stressful on each occasion. I would always worry about how I would get my heavy household appliances out of the apartment and onto the removal truck. If you haven’t ever moved heavy items around your home then let me tell you it’s difficult, so any help is always greatly appreciated. In the past it has taken an age to move appliances, I have strained muscles and damaged flooring. The solution came in the form of a friend lending me there Appliance dolly. It was my first contact with an appliance dolly and it solved my problem. Finally I could move appliances without scraping the floor and with speed. Appliance Dollies in there various forms are used by many professional movers to relocate heavy and bulky items safely and without damage. If you are at any point during a home move you start to feel unsure about safely moving the heavy appliances around your home and then loading them onto a truck, consult a professional mover. They will take all the stress and pressure from you but at a cost. The weight of the dolly will impact how easy a move could be. The lighter a dolly the easier it will be the maneuver around items that you want to move. Based on the type of items you expect to move on a regular basis, you want to look for an appliance dolly that can safely handle the weight. If you are regularly moving large heavy household items then go for an appliance dolly capable of lifting 500lb or more. Some dollies will come with a built in ratchet/strap mechanism that will allow you to safely support the load during a move. You don’t want a refrigerator falling off mid move. If you want to move loads up and down stairways then look into getting an appliance dolly with stair guides, which make it safer to move loads up stairs. Although all dollies will be manufactured to a high standard you may want to consider the type of material used to make the dolly since they can affect the weight and robustness of the unit. The most common materials used are either steel or aluminum. The length of the warranty for the appliance dolly can be a factor since it will be used to carry heavy items and can be prone to failure if there is any manufacturing defect. Then put your foot on the dolly and lift up, your now ready to move the appliance to its location. The load capacity for the equipment can vary on the type used but you can get dollies that are capable of lifting 1200 lbs. The average cost of an appliance dolly is around $90 but can vary depending on the manufacturer you pick. If you are constantly moving apartments then having this piece of equipment will save you loads of time and reduce the stress associated with moving house. Now that you have seen the options and reviewed our top picks for the best appliance dolly on the market, its up to you to pick what meets your needs, is in your price range, and overall help you gear up for your move. As you know, new dollies are being created all the time by new and old manufacturers. For that reason, the site will be updated as new dollies. Or if you feel like we missed a superior model that needs to be included, let me know by contacting us!